Royal Restrooms of Arizona also offers shower trailers. Now, you can have a combination of our mobile shower trailers and restroom. Our shower trailers were designed with space in mind. With Royal Restrooms, the shower trailers are compact enough to be placed in different areas and can fit in the most challenging of spaces. Each shower trailer features a private spacious room that includes such amenities such as propane on demand hot water, shower, flushing toilet, pedestal sink, mirror and climate controls. 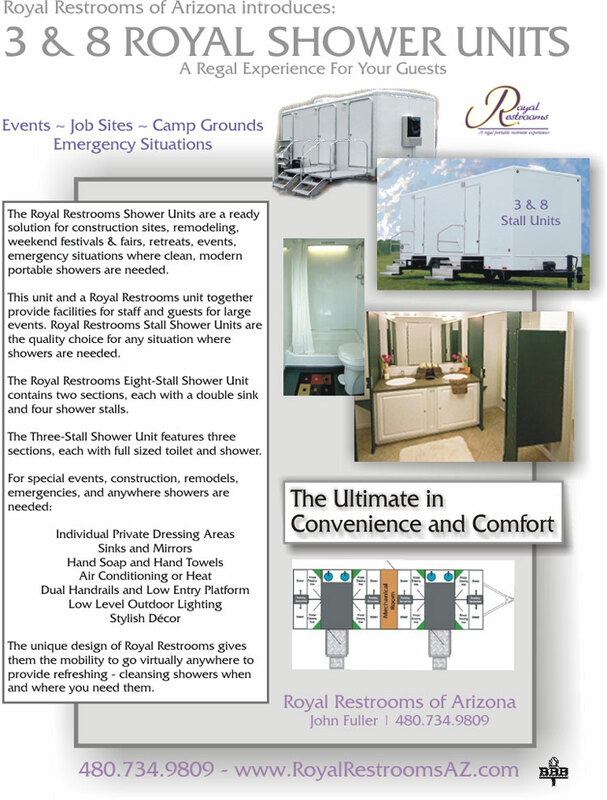 Royal Restrooms can combine any and all of our shower trailers for your use at any event. Royal Restrooms expanding fleet can handle all of your shower and restroom needs with our nationwide office locations. We can mobilize to anywhere in the lower 48 United States or surrounding countries such as Mexico and Canada as well. Length: 20' | Width:12' | Heights: 10' 6"
If power is not available onsite, a generator could be provided for use to power the units. If water is not available a limited onboard supply of fresh water can be filled and delivered. The holding capacity of each tank is approximately 130 gallons. Also available 325 Gallon Whisper Wagon water supply.